Canary Illness. First Actions To Take With A Sick Canary Bird. is to make your bird comfortable. It can be incredibly difficult to know what kind of illness your bird has...He could be suffering from a bacterial, fungal, or viral infection. There could be plenty of other things that are making your canary bird look sick, too. You don't want other birds to catch whatever it is he has. Canaries are high stress birds. They're always on edge. Provide a place without sudden noises or lots of movement or activity taking place. Maybe a warm bedroom in the back of the house or the master bath. Remember...he needs calm healing relaxation. His immune system does a much better job when there is little stress. symptoms-->sitting still, all hunched up with his feathers fluffed up, and not singing. He's trying to keep warm. One of the best things you can do for your canary is to have a good understanding of symptoms. 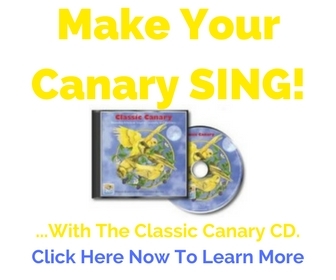 Click here to learn how get your free Canary Bird LISTENING Jump-Start eCourse and begin reading your canary's body language like a pro. Even if he doesn't look chilled you can still provide him with some warmth. It will make him feel better and will speed the healing process. These special cages are made specifically for sick birds who need to be separated from other birds and who need warmth. They're built with lights installed--usually in a separate compartment--for creating heat. A temperature gauge on the side of the cage lets you know how warm things are-->85-90 degrees Fahrenheit is about right for fighting canary illness. Most hospital cages are built and used by breeders who have a lot of birds around. For the average Josephine Canary-Owner it is a luxury...not a necessity. Try to use a very heavy dark cloth. You don't want any bright light coming through the cloth. Too much light can throw your sick canary into an early molt...further exasperating matters. For this reason I really don't like using household lamps. You're forced to turn it off at night because of the light...unless you cover the entire cage with the cloth. A ceramic lamp puts out heat but NO light. This is ideal because--like I just said--being exposed to too much light could cause an off-season molt and that would just make his problems worse. You really should have a ceramic lamp on hand at all times. Sometimes warmth is ALL you need to cure a canary illness. If you don't have one please get one ASAP. Make sure he has plenty of seed, fresh water, and his favorite treat. Careful with the treats though. Just use common sense...If your sick canary has diarrhea don't feed him greens. Although a sweet treat like a honey stick or sugar water can perk-up your sick bird...go easy on the sweets. There is little nutritional value in them. ...it would be a VERY good idea to give him some medication to help him fight off this canary illness. 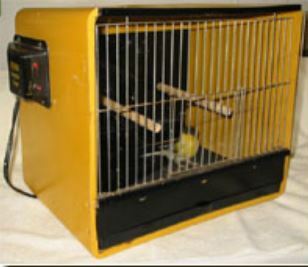 What medications should a canary owner use? Glad you asked. First of all-->Get yourself a ceramic lamp like we talked about above. It literally can be a life-saver for your canary. Warmth is so important! Whether a virus or bacterial infection or some other canary illness...there are a few things you can give your sick bird to fight the enemy and hopefully-->Win the War On Canary Sickness. Click here to learn what canary illness medications you should ALWAYS have on hand AND when to use them. How can I heal my canary's limp.? Return from Canary Illness: First Actions to CanaryAdvisor.com Home.